Standing on a corner in Dunwoody GA in front of Chesnut Elementary School, working with school representatives and public works to determine the best place for a crosswalk. Update: This afternoon I met with Devin Ramo and Lori Hummel of the Chesnut Parent Teacher Council, Mrs. Williams the Principal of Chesnut and Mrs. Mindy Sanders the City of Dunwoody Capital Projects Manager to discuss all possible crosswalk options and the pros and cons of each option. In the end after much discussion and sensing the frustration of Mrs Williams, I point blank asked her with all of your knowledge of the school and the flow of your students where would you want the crosswalk? 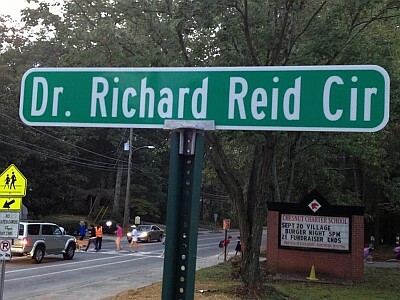 She stated near the bus lane (now called Dr. Richard Reid Circle), just north of the current crosswalk. We thought that the crosswalk should ideally end on school property with no other crossings where vehicles transverse, be located near the front of the school but also needed to be in a location with only two lanes of traffic where there was no car pool lane. Since the car pool lane was troubling the design, we sketched an idea to bring back to the traffic engineers whereby concrete would be added to add a pedestrian landing / moving the start of the car pool lane and placing the main crosswalk to Chesnut at that location. Below is a photo of what the traffic engineers and safety professionals will be reviewing. I explained to Mrs. Williams and the PTC members that we would need to revert back to a status quo for the start of the school year but in the end there will be an upgraded crosswalk with lights engineered safety improvements that everyone can be proud of. Somethings just take time. Presentation from Dunwoody Woman's Club to City of Dunwoody. Presentation of Georgia Traffic Injury Prevention Institute Award. Approval of Award of Contract to Resurface the Dunwoody Senior Baseball Parking Lot. SECOND READ: Amendment to Chapter 2 Administration - Terms of Boards and Commissions. Approval of Award of Contract Award for Roberts Drive Sidewalk Construction. Resolution Appointing Members to Serve on Urban Redevelopment Agency - Marian Adeimy. Resolution Appointing Members to Serve on Volunteer Coordinating Committee. Crown Pointe Parkway, Dunwoody, GA 30338. The Tax Parcel is 18 349 01 003. Approval of AJC Dunwoody Winefest Temporary Sign Request. Tuesday is election day and Dunwoody here are your choices. The General Primary/Nonpartisan Runoff Election is Tuesday, the polls open at 7:00am and close at 7:00pm. Voter turnout will be low, please do your civic duty and vote; otherwise you will have no one to blame when you are not happy with the final selection representing you. Note that everyone gets to cast a vote for Sheriff as this specific election is non-partisan. Drawing with all details in PDF. Project scheduled for early Fall. Prepare for delays - Vermack / Womack Road storm water repairs. As I mentioned in an earlier post, we knew this was coming and following this repair Vermack will be a priority for repaving. The City of Dunwoody is replacing damaged and deteriorating storm water structures on Vermack Road near the intersection of Vermack Road and Womack Road. This project will increase the capacity of the lines, replace damaged infrastructure, and help alleviate flooding effecting the roadway and local homeowners. The project is expected to take four weeks and the city anticipates completion of the project prior August 11. Both lanes of traffic will be maintained on Vermack Road to the best extent possible. There may be limited times the road will be decreased to one lane of travel. Any closures will be limited. These dates and times are subject to change dependent on weather conditions. We appreciate your patience while the city completes this critical infrastructure improvement. If you have any questions about this project please email the Public Works Department at public.works@dunwoodyga.gov or call 678-382-6850. Dunwoody Elementary crossing guard makes City a proposal to assist with troubled intersection at the High School. 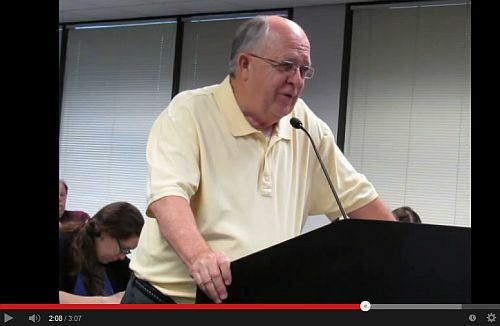 At the Dunwoody City Council Meeting on Monday, Mr. Larry Adams the crossing guard at Dunwoody Elementary presented the City Council with a proposal to assist with traffic control at Dunwoody High School both in the morning and afternoon after his shift at DES. 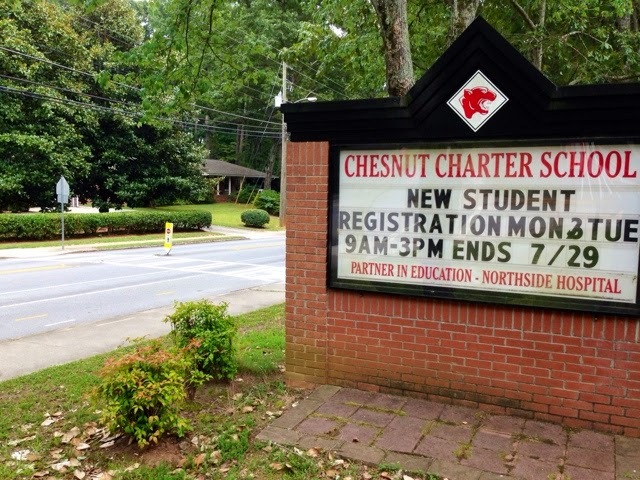 The DeKalb School System does not pay for crossing guards above elementary school therefore the proposal would need to be paid by the City of Dunwoody. The sum of $3,100.00 ($18.00 per hour) for the school year is reasonable and I am in favor of taking Mr. Adams up on his offer. I am guessing this is currently under legal review and then discussions might have to take place with the new Principal Tom McFarrin and the DCSS Administration. 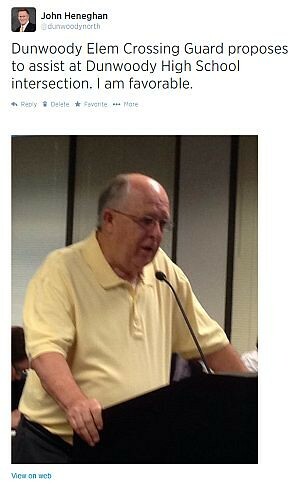 Mr. Adams has requested a formal meeting to discuss the proposal and I hope it takes place soon. Fyi - School starts August 11th. Tweet I sent during meeting. 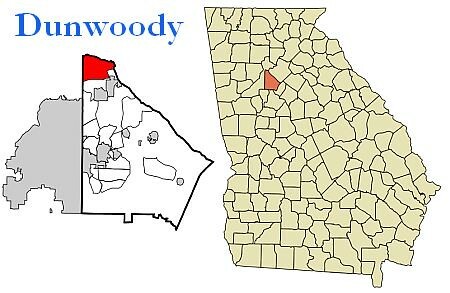 The City of Dunwoody, a picturesque community incorporated in 2008, is located on the north side of metro Atlanta with an estimated population of more than 46,000. Dunwoody is home to a large high-end shopping mall (Perimeter Mall), a significant collection of Fortune 500 companies and an affluent residential base. The City has many vibrant neighborhoods, a variety of places of worship, a growing restaurant scene, several neighborhood level shopping centers and office complexes. The City is strategically situated at the intersection of several major highways and sits along 1-285, the beltway surrounding the City of Atlanta. The road network and public transit provide easy access to Buckhead, Midtown, Downtown and Hartsfield Jackson International Airport. Dunwoody is regarded as a family friendly and convenient location for businesses and visitors.The City of Dunwoody operates under a Council-Manager form of government. The Dunwoody City Council is comprised of a Mayor and six Council Members elected by the people on a nonpartisan ballot for four-year terms. Under the City Charter the Mayor appoints a City Manager subject to the consent of the City Council. The City Manager works closely with the Mayor and Council to assist them in formulating policies and programs and is responsible for the efficient ongoing operation of all City services as set forth by the City Council. Dunwoody has a current general fund budget of $25,169,000 and employs 70 FTE’s. To maximize effectiveness and efficiency, Dunwoody contracts with vendors from both the private and public sectors to provide some municipal services. These vendors are responsible to the City Manager.Minimum requirements include education and experience equivalent to a bachelor's degree in public or business administration (MPA preferred) combined with successful experience as a local government manager or assistant manager in a complex community comparable to Dunwoody. Ideal experience includes economic development, redevelopment and outcome-based organizational performance measurement. Must understand the elements of economic sustainability in a suburban community. The successful candidate must clearly possess and apply superior communication, organizational management and staff leadership skills and abilities.Highly competitive starting salary and excellent benefits negotiable depending upon qualifications and experience. Residency is strongly preferred but not required. 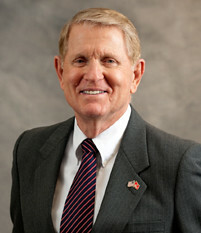 Additional information about the City can be found at the City’s website: www.dunwoodyga.gov. Presentation of the 2013 Annual Audit Report. Request for Nominations to the Dunwoody Volunteer Coordination Committee. Presentation from DeKalb County Sanitation - Pilot for Automated Trash Collection and Once/Week Pickup. Approval of Employee Retirement Plan Amendment. Approval of Employee Salary Deferral Plan Amendment. Discussion of Amendments to Chapter 8, Buildings and Building Regulations. SECOND READ: Ordinance Granting a Temporary Right of Way Easement for KDC. Discussion of Contract Award for Roberts Drive Sidewalk Construction. Discussion of Contract to Resurface the Dunwoody Senior Baseball Parking Lot. Discussion of AJC Dunwoody Wine Fest Enlarged Temporary Sign Request. FIRST READ: Amendment to Chapter 2 Administration - Terms of Boards and Commissions. Discussion of Appointments to City Boards. 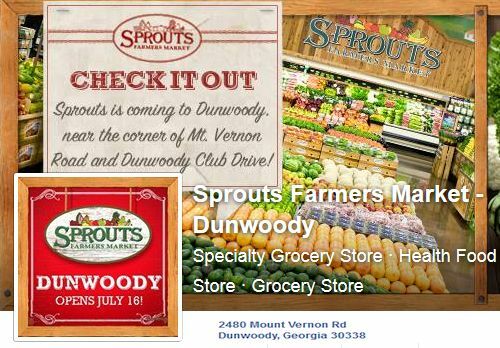 Sprouts Farmers Market - Dunwoody opens Wednesday 7 am and reminder of other Restaurant Openings . WHEN: Wednesday, July 16, at 7 a.m.
· Upon checkout, every 15th shopper will receive a coupon book featuring exclusive Sprouts savings. · The first 100 customers to make a purchase will receive a coupon booklet for five free sandwiches. · We’ll be hiding 20 golden tickets on products throughout the aisles. If you find one, you’ll get $20 off your purchase. Takorea of Dunwoody is locally owned and will offer a fusion of Korean and Mexican cuisine. The restaurant is opening soon in the Georgetown Shopping Center in the old Guthries location. The Pub is coming to Dunwoody Perimeter Mall, filling former Hudson Grille space. I was at Perimeter Mall today and saw a storefront accepting employment applications. Union Hill Kitchen is now open in downtown Chamblee at 5225 Peachtree Road, near the Chamblee MARTA station. The restaurant is being opened by Chef Alexis Hernandez,who hails from Union City, New Jersey. Research on Chef Alexis Hernandez, indicates that he was a finalist on The Next Food Network Star, season six. Southbound is a second fine dining establishment in downtown Chamblee at 5394 Peachtree Road that is now open. FYI, my local casual favorites are still Empire State Pizza for simple sit down and Gyro Gyro for eating on the run. Local restaurants that I need to try are Carbonara Trattoria and it has been way to long since I was last at McKendrick's Steak House. We are truely blessed with so many fine choices. The City of Dunwoody is currently engaged in several beneficial and exciting infrastructure projects in different phases of active development and construction. The City of Dunwoody has a land area of over 13 square miles, accumulating approximately 50 inches of precipitation per year. That is a lot of rainwater and it has to go somewhere. The city completed a survey of the storm water infrastructure system in 2011, identifying 10,289 structures, and 8,377 conveyances. The majority of these structures are close to 40 years old and ready for replacement. The city will be replacing a deteriorating storm drain culvert that runs beneath Mt. Vernon Road between North Peachtree Road and Jett Ferry Road beginning Friday, July 11 after 7 p.m. The section of Mt. Vernon Road between North Peachtree Road and Jett Ferry Road will be closed. Traffic will be detoured around the construction; however, residents that live on Mt. Vernon Road, Saffron Drive, and North Peachtree Rd. will have local access via Mt. Vernon Road. Parishioners of All Saints Catholic Church will be able to access the church for Saturday and Sunday services. Work is expected to be complete before 6 a.m. Monday, July 14. Work on the latest segment of the Brook Run multi-use trail is about 90 percent complete. Weather permitting, the city anticipates construction crews will finish the 1.3 mile addition to the multi-use trail at Brook Run Park by the end of July. Once complete, the entirety of the Brook Run Trail will include decorative benches and waste/recycling receptacles along the trail route for beautification and convenience. Stay tuned for details of the Grand Opening! As future phases are completed in the coming years, the Dunwoody Trailway will run from Brook Run Park to Chamblee Dunwoody Road and will cover 3.3 total miles. On March 8, 2012, the City unveiled a new redevelopment initiative: Project Renaissance – A New Georgetown. This initiative is a revitalization effort to implement the community-developed Georgetown / North Shallowford Master Plan (adopted in 2011) and promote a catalytic redevelopment opportunity for the Georgetown area. Project Renaissance activates 35 acres of land off of North Shallowford Road – a 16 acre parcel and a 19 acre property. As Project Renaissance continues to promote positive change in the Georgetown area, development of Pernoshal Park is moving forward. The new 5-acre park will be located on the North Shallowford side of the 19-acre property. Development of the construction documents for the park are in the final stages. Once approved, construction of the park can proceed with an expected grand opening mid-2015. Pernoshal Park will feature an open play field with terraced, grassed seating for picnics and casual recreation. A large pavilion will provide shade for small events and family outings and visitors can have fun playing basketball or pickle ball on one of the three sports courts. John Wieland Homes and Neighborhood’s redevelopment of the 19-acre site will also create a vibrant center of activity in Georgetown. The residential development will be a quiet enclave of single family homes, tucked away from the liveliness of the park and open space, but still very much connected and an essential part of the success of the overall redevelopment. Construction crews continue to make progress on the Dunwoody Village Main Street project. The curbing and driveway entrances on the south side of Dunwoody Village Parkway have been completed and crew are finishing up with the sidewalk construction. Final preparations are being made on the roadway for paving work on the south side. After completion of the south side paving, crews will shift to commence work on the north side, moving traffic to the south side of the thoroughfare. The timing of the traffic signals at either end of the parkway (at both Chamblee Dunwoody Road and at Mount Vernon Road) are running on fixed cycles until the construction is completed. Once work at these intersections is complete, the signals will be re-set to operate via the inductive-loop traffic detector sensors typically installed at signalized intersections. For additional information regarding the Main Street project please contact Michael Smith, Public Works Director, at 678-382-6850 or email michael.smith@dunwoodyga.gov. 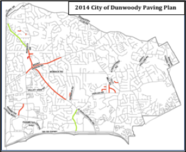 The City of Dunwoody has selected URS to be the consultant to design multimodal improvements for Chamblee Dunwoody Road from Cotillion Drive to Peeler Road/N. Shallowford Road. 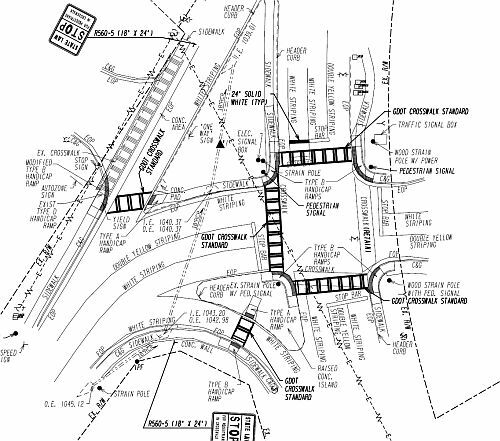 They have also been tasked with designing concepts for the intersections of Chamblee Dunwoody Road at Peeler Road/N. 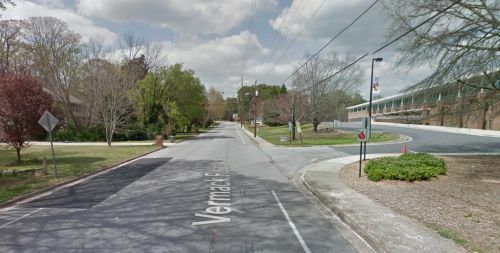 Shallowford Road and at Vermack Road as well as for pedestrian connectivity along Cotillion Drive between Chamblee Dunwoody and N. Shallowford Road. This project scope includes operational improvements for vehicles as well as upgrades and expansion of the existing pedestrian and bicycle facilities along this corridor. It also seeks to enhance the area with the development of a gateway to our city and streetscape design along the corridor. The city held a “Kick-Off” meeting earlier this month with URS (the consultant), Georgia Department of Transportation, and the Atlanta Regional Commission to discuss next steps for this important project. URS will begin a survey of the corridor at the end of July, allowing for more detailed concepts to be presented to the public. Additional public meetings will be held this fall. Please stay tuned to the City of Dunwoody website and future city emails for exact dates and times. 1. Dunwoody Independence Day Parade … Our parade is not only the biggest in Georgia but also the best. There were over 170 entries in the parade and over 30,000 of the best citizens in the nation lining the parade route. We all owe Pam Tallmadge and Penny Forman - they are in charge of the parade - and all the other volunteers that make our parade a success a vote of thanks. Yes, the entire parade is put on by volunteers … that is what I call great community involvement/spirit. Also a thanks to all the “Chaplains" in our city for the weather prayers that brought us the great weather. 2. Voting … The Georgia Primary run off election takes place on July 22, 2014 at you normal polling place … polls are open from 7 AM to 7 PM. You can also vote in person in Early/Advanced Voting M thru F from 8 AM to 5 PM at DeKalb County Voting Office, 4380 Memorial Dr, Suite 300, Decatur, GA 30032 thru July 18. Absentee voting is also available. Go to this site to get your absentee ballot application … http://sos.ga.gov/elections/elections/voter_information/absentee_ballot_app.pdf. You can either mail the application to the address above, fax it to 404-298-4020 or email it to mwdaniel@dekalbcountyga.gov … I recommend faxing or emailing. Dekalb is very good with quick response to get a ballot to you. You must select either a Republican or a Democratic ballot. The Republican ballot has three races … U. S. Senate, State School Superintendent and the very important DeKalb County Sheriff. The Democratic ballot has two races … State School Superintendent and the very important DeKalb County Sheriff. Who ever you are voting for PLEASE vote. I hope Dunwoody has a lot higher voter turnout than we did at the Primary Election in May. 3. Property Appeal … Just a reminder to everyone that if you are going to appeal your 2013 property tax assessment the deadline in next Monday, July 14. Your appeal must be done in writing and postmarked no later than July 14. Appeal information/instructions are on the property tax assessment that you received from DeKalb County. 4. New Fire Equipment … Tomorrow, July 11 at 2 PM DeKalb County (DC) Fire Rescue will be placing a brand new state of the art Fire Pumper (Fire truck in our words) is service at Station 12 located on Roberts Dr by Dunwoody Senior Baseball Park. The community is invite to come and observe the ceremony. We have also have been advised that DC has (6) 70 Ft ladder truck in production and one of those truck will be placed in our Dunwoody Fire Station 21 located on Crown Park Parkway. 5. Traffic … Remember that our fellow pedestrian citizens have rights to cross the street in crosswalks. If you see someone in a crossway on your side of the road they have the right of way. A yield sign does not give the driver right of way over a pedestrian in a crosswalk. Lets all be courteous to our fellow citizens and take care of each other. A word to the wise … our Police has stepped up enforcement of crosswalk violators. 6. Community Beautification … A step to enhance our community appearance would be for all of us not to put our trash out in front of our houses until the evening before the trash pick up. If you are leaving town ask you neighbor to take you trash out for you. Also taking your empty trash container off the street the same day as pick up is a nice touch. I am sure your neighbors would be appreciative of these actions. 7. Car Break-Ins … We continue to have a rash of car break-ins where an item/items of value are left in plain site. The bad guys are just walking around looking for easy victim. They can break a window and be in and out of your car in less than a minute … don’t give them a reason to break into your car. Keep anything of value or that gives the appearance of possibly being of value out of sight. 8. Town Hall Meeting … The Town Hall or Citizen Connection meeting for District One will be held on AUG 28th from 7 to 9 PM at the Dunwoody Nature Center’s new covered pavilion. Councilman Terry Nall and I will be your host. 9. That is all from here tonight. I trust all of you are enjoying this nice warm summer. Keep yourself up-to-date by checking our city website @ www.dunwoodyga.gov. Remember we are all neighbors so lets be kind to each other. Please pass this update on to your friends, neighbors, members of your HOA and anyone you think maybe interested. If you would like to be added to my update email list just let me know and I will make that happen. I appreciate your thoughts and comments so keep them coming. Botched Aug 2013 DeKalb County boil water advisory affects hundreds of thousands - also issue not noted in annual report to consumers. A Channel 2 Action News investigation found that DeKalb water officials made a serious error with a public health warning last summer. The head of the agency downplayed the scale of the risk, even as complaints poured in from all over the county. When water pressure drops too low, for any reason, there’s a risk the water will become contaminated. In this case from August 2013, that risk was system wide, affecting 700,000 people. A state inspector complained soon after that DeKalb County had a pattern of not issuing required public health warnings. 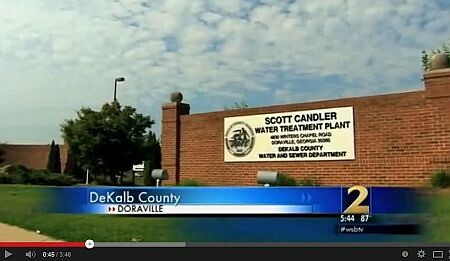 The problem started at DeKalb’s massive Scott Candler plant in Doraville. DeKalb County’s response to the drop in water pressure made it seem like a minor disruption, affecting only 37,000 customers in Tucker. But, what virtually no one knew in August is that DeKalb County was besieged by customer complaints about low pressure from Lithonia, Tucker, Stone Mountain, Decatur, Chamblee, Doraville and Dunwoody – the entire county. DeKalb County Consumer Confidence Report (CCR) seems to forget about the above issues. "DeKalb County Department of Watershed Management provides its customers with high quality, safe drinking water that surpasses the United States Environmental Protection Agency (EPA) and the State of Georgia Environmental Protection Division (EPD) requirements. DeKalb County has consistently produced superior quality drinking water. " This information looks to be missing from the 2013 Consumer Confidence Report that was published in May 2014 to me. Maybe it will be noted in the next one? Dunwoody Food Truck Thursday from 6 - 9 pm at Brook Run Park. 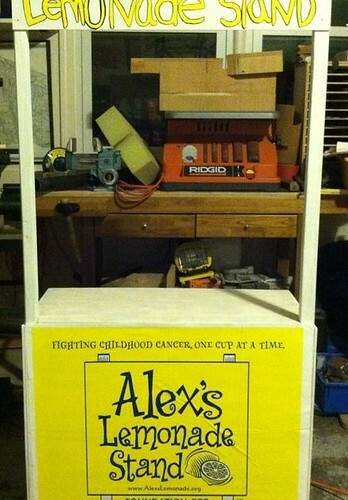 Check out Alex's Lemonade Stand and walk the Brook Run Trail too. We are so excited to see y'all this week for Dunwoody Food Truck Thursdays! We have an awesome lineup for dinner + Action Jackson will be performing! Come, enjoy the park with us! Please buy some lemonade from Coach Coffey's Lemonade Stand - on the field by the band. ALL profits go to Alex's Lemonade Stand in memory of Jared Forman. If you have the opportunity, please work up an appetite or walk off your meal at the newly completed 1.82 mile (by my calculations) Brook Run Trail. It is very impressive with much of the trail being located in the shade. Georgia's Largest 4th of July Parade kicks off at 9 am in Dunwoody with Grand Marshal Governor Nathan Deal. 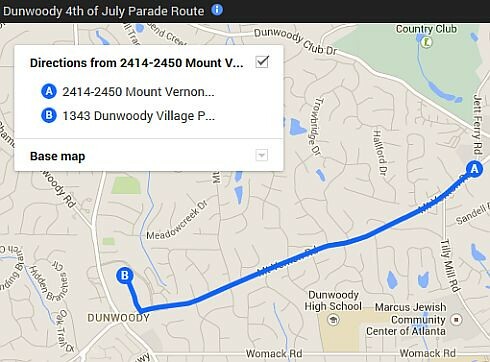 On Friday, July 4, 2014 at 9:00 a.m., the Dunwoody Homeowners Association and the Dunwoody Crier Newspaper will host the annual Fourth of July Parade featuring marching bands, floats, clowns, animal units and local celebrities. Last year the parade attracted over 2,500 participants and 32,000 spectators! 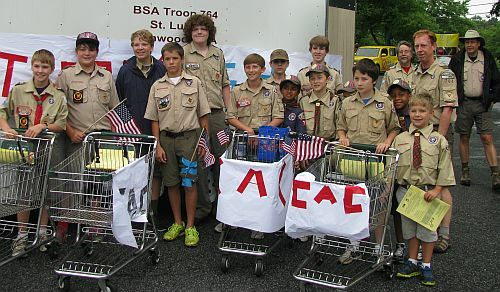 Troop 764 and the Community Action Center ask that you bring canned goods to the parade route on July the Fourth for donation to the Community Action Center. Please only bring non-perishable goods. Particpant Information: Numerous organizations, community groups and non-profits are walking or biking in the parade many of whom would enjoy you joining them for the two mile trek. I know that the "Bike Walk Dunwoody Group" would welcome additional participants so if you are interested please learn more by clicking here. The parade is hectic and safety is paramount therefore rules are in place to protect everyone, please be mindful of them. Parade spectators are encouraged setup chairs along Mt. Vernon and Dunwoody Village Parkway. Spectators will be blocked from viewing on the east side of Jett Ferry on Mt. Vernon due to the staging and setup for parade participants. Viewing will start on the west side of Jett Ferry on Mt. Vernon. The parade route is ~2 miles and steps off from the intersection of Mount Vernon Road and Jett Ferry Road at 9:00 a.m., proceed west on Mt. 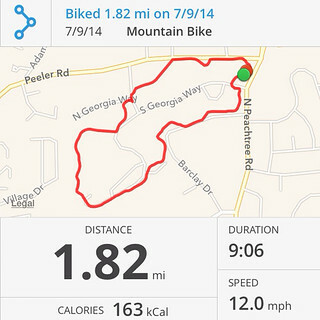 Vernon to Dunwoody Village Parkway. Turn right and follow the right side of median to Marlow's Tavern, turn left into Dunwoody Village parking lot. Volunteers will guide you to parade parking. It takes approximately 1 hour to walk the entire parade route. Mt. Vernon Road between Jett Ferry Road and Dunwoody Village Parkway will be closed from 8:40 a.m. to 11:40 a.m. [times are approximate; contact the Dunwoody Police Department for specific questions about road closures and traffic information]. 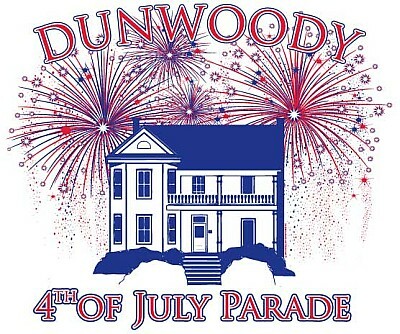 Please join the Dunwoody community after the 4th of July Parade in front of the US Post Office in Dunwoody Village for family fun and great food. The ceremonies begin at 11:30 a.m.
Equestrian Color Guard will be available in a horse coral for photos and petting. Please do me a favor at Food Truck Thursday in Brook Run - buy a Lemonade for a good cause. 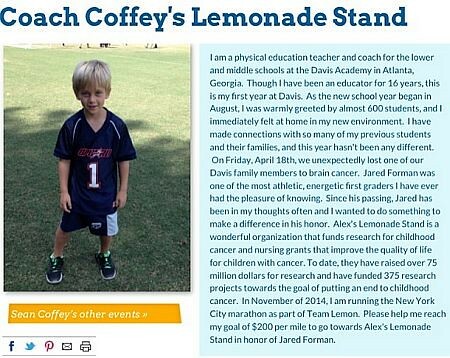 I have a soft spot in my heart for Lemonade Stands & Children's Cancer research therefore when I noticed that Coach Coffey from Davis Academy will be running an Alex's Lemonade Stand all month at Food Truck Thursdays to raise money; I thought I would bring it to your attention. Let's keep him busy if you are in attendance and if you would like to donate directly, click here. Finished the lemonade stand. Come out to Food Truck Thursday @ Brook Run Park in Dunwoody GA, buy some lemonade, and help cure childhood cancer one cup at a time! We will be there all month.